The adorable Creme Egg bunny bums are the perfect feature for any Easter party! A bit of a departure from the norm today! I don’t usually post such fun and frivolous recipes – usually I’m far too lazy to try anything this detailed – but with Easter coming up, I thought I’d share something cute to mark the occasion. These adorable Creme Egg bunny bums would be a great feature at any Easter-themed party! Years ago, my lovely friend Emily from A Mummy Too shared these amazing Creme Egg chicks, and ever since I saw them, I’ve been wondering if I could make a version with a different Easter animal. I did think of just making a ‘proper’ bunny, but in the end I decided to make Creme Egg bunny bums. Because the only thing cuter than a bunny is a bunny bum (it’s a thing, I’m not just being weird). I’ll warn you, these Creme Egg bunny bums aren’t the sort of thing you can whip up in 10 minutes. They’re simple, but they are a little fiddly, and do take a bit of practice to get right. Luckily I’ve done most of the experimentation on your behalf, and have come up with the best way to make these work (e.g. using white chocolate for the bunny’s paws worked way better than writing icing), but you may still need a couple of practice tries to get into the swing of things. Since they do take a while, I’d recommend not making too many, even if you’re hosting a big party – just make a few to feature alongside some plain Creme Eggs. Because these Creme Egg bunny bums are a bit more intricate than my usual simple recipes, I thought I’d make a little step-by-step guide to help you out! Firstly, make your bunnies’ feet. Cut some milk chocolate buttons in half, and draw on some paw prints using melted white chocolate. I found it easiest to use a toothpick for this. This step is actually easier than it looks – you can always scrape off any unwanted smears of chocolate with a clean toothpick. Leave them to set completely. Next, use a dab of melted milk chocolate to attach some mini marshmallows to the wider end of some Creme Eggs (again, I used a toothpick for this). I found the ‘tails’ looked best if I cut the mini marshmallows in half first, so they were a little smaller. Make sure you use vegetarian mini marshmallows (Amazon UK* / Amazon US*) if needed! Halve some more chocolate buttons, and use some more melted chocolate to stick them onto the narrow end of each Creme Egg. You’ll need to hold them in place for a few seconds until the chocolate starts to set, but try not to handle them more than necessary otherwise they may start to melt. Finally, use (you guessed it) some more melted chocolate to attach the bunny feet alongside the marshmallow tails. And that’s it! Your Creme Egg bunny bums are complete. Tell me these aren’t the cutest thing ever? Cut 4 of the milk chocolate buttons in half. Melt the white chocolate in a small dish in the microwave, and use a toothpick to draw a 'paw print' on each piece (see photos for a guide). Place flat on a plate, and leave to set completely. Meanwhile, melt a few squares of milk chocolate. If needed, trim one end of the mini marshmallows so they're a little shorter, then use a dab of melted chocolate to stick them onto the wide end of each Creme Egg, slightly off to one side. Cut the remaining four milk chocolate buttons in half, and use some more melted milk chocolate to stick them to the narrower end of the Creme Eggs (the 'ears' - see photos for a guide). You'll need to hold them in place for 30 seconds or so until the chocolate sets enough to hold them - but be careful not to melt the chocolate with the warmth of your hands. Use some more melted chocolate to stick the bunny 'feet' to the base of each Creme Egg, either side of the marshmallow 'tails'. Store the Creme Egg bunny bums in the fridge until ready to serve. 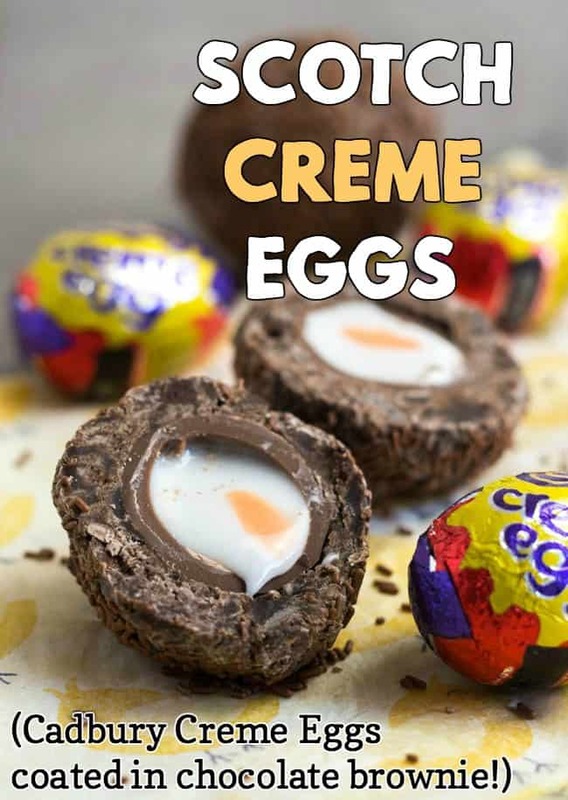 Want another fun Creme Egg recipe to make this Easter? Try my Scotch Creme Eggs! * Note: This post contains affiliate links. If you make a purchase using one of these links, I will receive a tiny (tiny!) sum, at no extra cost to you. Thanks for the support! Wow look at that details, I would like to try making this dessert this easter but I think I can’t promise a large quantity though. The kids would love this. Yes I definitely wouldn’t make more than a few!! Oh my word. Not only do these look absolutely delicious but these are so super cute! Perfect for Easter!